Oil of Oregano contains antioxidant phytochemicals that support the body's natural resistance. We use this product in all of our anti-fungal and candida diet protocols. 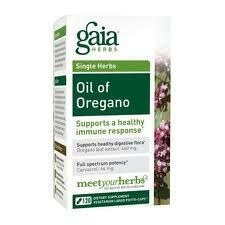 Gaia Herbs extract of Oregano contains potent phenols, including Carvacrol. Oregano oil helps support a healthy microbial environment in the intestines and initiates a healthy immune response. The company is top notch in terms of sourcing , purity and their farming practices. They truly are a leader in organic farming and herbal medicine.